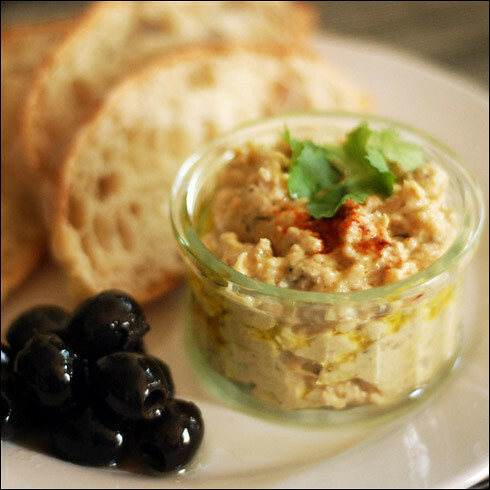 As I'm currently on holiday in Turkey, it feels fitting to end the Recipes Revisited series on one of my all-time favourite mezzes, Baba Ghanoush, or Moutabal as it is sometimes known. I like hummous, but the moment I see Baba Ganoush any desire to eat the hummous goes out the window. It is absolutely delicious - filled with warm, earthy flavours from both the chargrilled aubergine and paprika. I like it served with nothing more than fresh rustic bread; be it ciabatta, Lebanese flatbreads or a really good sourdough. If you have a gas hob, place the aubergines over an open flame and grill until charred, turning occasionally. This lends a wonderful smokey flavour to the aubergines. If you don't have a gas hob, you can also place the aubergines under a hot grill (pierce them first so they don't explode!) though this doesn't lend quite such a smokey flavour. Set the aubergines aside to cool, then slice in half and scoop out the flesh. Take care to avoid the charred skin. Roughly chop the aubergine then set aside to drain for about half an hour. In the meantime, prepare the rest of the dip: pour the boiling water into a bowl with a tablespoon of tahini paste and mix until the two ingredients form a paste. Crush in the garlic cloves and add the lemon juice, paprika and pomegranate molasses. Once the aubergine has drained, stir it into the tahini paste mix, finely chop the coriander and add that too, season with salt and pepper then taste. You might find it needs a little more lemon, salt or even pomegranate molasses. The Baba Ganoush should taste smokey, but not too dense. Serve in a bowl and garnish with a drizzle of oil, a sprinkle of paprika and a sprig of coriander. I LOVE Baba-Ghanoush. Anything with Aubergine wins all sorts of prizes with my anyway, but the earthy smoky-ness is the best. Great sounding recipe.